Like most people, you probably get a blood test and keep your fingers crossed until the results come back. But while these tests focus on key components of your blood, they provide only a limited view of what’s going on in your body. Blood tests don’t tell you about heavy metals or unwanted pathogens that maybe coursing through your body. They don’t tell you how strong your immune system is or whether your cells are getting the nutrients they need. Only when something goes very wrong—and has possibly been going wrong for years—do your blood tests indicate a problem. What’s in Your Blood & Why You Should Care is the first book to provide a complete picture of the components that make up your blood, how your blood functions, and what you can do to improve the quality of your blood for greater health and longevity. Consider this analogy: Your arteries, veins, and capillaries are underground tunnels. Your blood is a long train that runs through thousands of these tunnels. Every second, thousands of passengers climb aboard the train, and thousands get off at their designated stops. This train has one specific purpose: To sustain a single life—yours. What happens if the train slows down or speeds up? What happens if some passengers are dangerous characters who rob or kill other riders? What happens if some passengers miss their stops? When this occurs, you get sick—or worse. By understanding what is truly going on in your body, you will know how you can keep the train working properly and maintain the safety of its most important passengers. 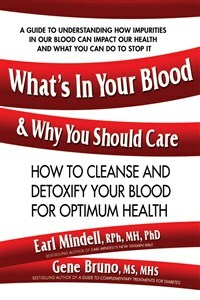 Written in easy-to-understand language, What’s in Your Blood & Why You Should Care tells you everything you need to know about your blood and instructs you in proven methods of cleansing and detoxifying your bloodstream. From diets to supplements to medical treatments, it’s all there in this groundbreaking book. Gene Bruno, MS, MHS, is Professor of Nutraceutical Science and Provost of Huntington College of Health Sciences. Prof. Bruno has graduate degrees in both Nutrition and Herbal Medicine, and is a Registered Herbalist with the American Herbalists Guild. He also headed the team the developed a Doctorate program in Integrative Healthcare at Huntington. For 37 years Prof. Bruno has educated healthcare professionals and others in nutrition, herbal medicine and nutraceutical sciences. He has also written numerous articles on nutrition, herbal medicine, nutraceuticals and integrative health issues for many magazines and peer-reviewed publications. He is also the author of A Guide to Complementary Treatments for Diabetes.